After weeks of preparation, my dream finally came true--bringing together two fine poets and dear friends from six thousand miles apart for a live poetry reading and Q&A with the global poetry-loving community. The poets were in great form, the questions from viewers were interesting and the conversation was intimate and wise. People "came up to me afterward" (in a virtual sense, through social media) to tell me how much it inspired them to hear both the poems and insights that both poets shared tonight. We discussed the practice of writing, the filmpoem genre, and how poetry, mythology, and life experience interweave and inform each other. The only major hiccup came at the very end, when the feed unceremoniously cut out on viewers about two minutes before we had said our final farewell. 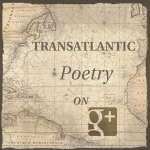 A virtual roar of discontent went up on the Transatlantic Poetry Community page from those tuned in. It means they missed the end of Andrew's sentence (no, he can't draw MacAdam exactly), my announcement of the three viewers who won a book, and a few parting words from me, gushing with thanks for all involved. Categories: Poetry and Readings. 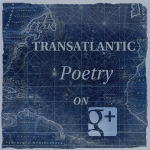 Tags: Transatlantic Poetry. Poets: Andrew Philip and Michelle Bitting.